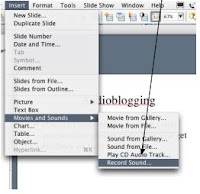 Recently I posted about putting PowerPoint slides on Cell phones (see Doug Belshaw's blog, he created a wonderful tutorial). Since then I have been "playing" with the idea and have developed a way to create PowerPoint Enhanced Podcast movies for cell phones. So an enhanced podcast includes images along with narration. The history site on Colonial Williamsburg is a great example of an enhanced podcast. There are some great benefits to being able to easily create an Enhanced Podcast and putting it on a cell phone. First, students can access class lectures/notes made with PowerPoint anytime on their cell phone. 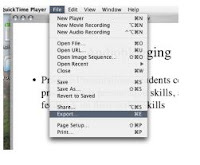 Additionally, students may be more likely to develop a PowerPoint project if they know they can share it to their friends and classmate's cell phones. Even parents can view them. 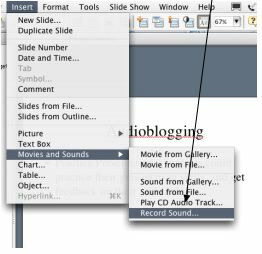 2) Record the narration for your slides by going to Slide Show--Record Narration. 3) When you are done, if you are on a MAC, go to FILE--MAKE MOVIE (this will convert your PowerPoint into a Quicktime movie). 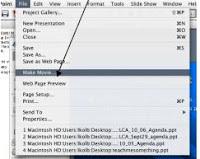 4) Once you have made your PowerPoint QuickTime movie, open it up in QuickTime Pro (if you do not have QuickTime Pro, you can use a free online converter such as http://zamzar.com). 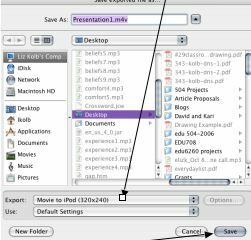 5) In QuickTime Pro, go to File-Export, export your movie as a 3G file (this is the only movie file type that will play on cell phones). 6) Now you are ready to upload your Enhanced PowerPoint Podcast to your cell phone. 7) If you have Verizon, go to https://picture.vzw.com/login.do and select "Send Message" (it will lead you through a tutorial to upload your "3G" podcast to any Verizon cell phone. 8) If you have any other provider use http://3guppies.com, and follow their online tutorial of how to upload to your cell phone. You are one of the most creative people with technology that I have ever met! I have watched the Colonial Wiliamsbug presentation many times and had no idea it was an advanced podcast.I wish i could have come to your workshop but I spent last week catching up on the work I missed while I was away.I just discovered that I have several ESL Spanish speaking Students in my ecology class at Huron and some of them are really struggling with the content in English. I can speak to them in Spanish but I was trying to think of ways to use technology to bridge the language barrier. If you can think of any technology that would be helpful in teaching them please let me know. Thanks!